This past June ranked as the 33rd warmest for the United States. The average temperature for the Earth as a whole, however, soared to a record high for a second straight month. According to a report released on Monday by NOAA’s National Climatic Data Center, June 2014 was the warmest June ever recorded for the entire planet. Earth’s combined average temperature for the month – over both land and sea surfaces – was 61.2°F. That is 1.3°F above the 20th century average. June 2014 also marked the 352nd consecutive month that our global temperature was above its long-term norm. Rising ocean temperatures, according to NOAA, helped fuel this record warmth. In fact, the June global sea surface temperature was 1.15°F above its long-term average of 61.5°F. That is the highest for any June on record and the highest departure from average for any month. Large parts of both the Pacific and Indian Oceans either hit record-high temperatures or posted readings that were significantly above normal. The report also noted that, year to date, 2014 is currently tied with 2002 as the Earth’s third warmest year on record. Global temperature records date back to 1880. 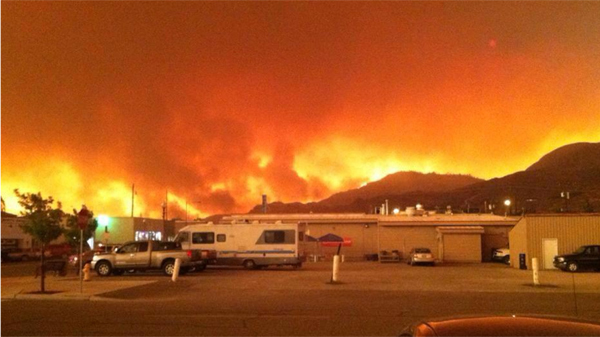 A massive wildfire is raging in Washington State. Situated about 120 miles northeast of Seattle, it is known as the Carlton Complex Fire. Starting off as four separate wildfires, they have now merged into one massive blaze. Charring 375 square miles of parched land since last week, it is now the largest wildfire the state has ever seen. 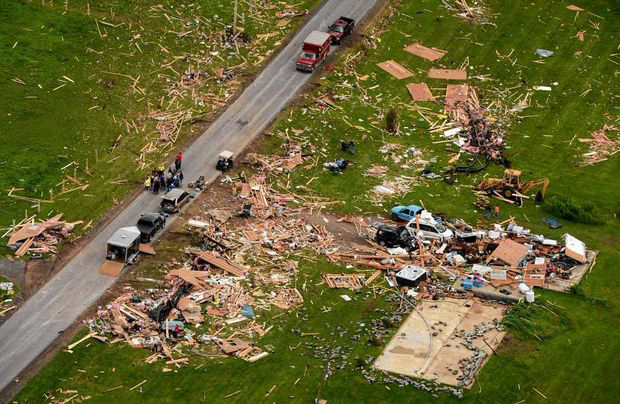 As of Sunday, according to local officials, more than one hundred fifty homes have been destroyed, hundreds of people have been displaced, and at least one death has been reported. Sparked by lightning, this fierce fire is being fueled by drought, unusually high temperatures, and gusty winds. Currently only 2% contained, weather conditions are likely to change in the coming days and give firefighters a helping hand. Forecasters say cooler, moist air will move into the region and winds should ease. Nonetheless, if this incoming weather pattern generates thunderstorms more fires could be ignited. This blaze, according to the National Interagency Fire Center, is just one of 24 large wildfires currently burning in the drought stricken American West. 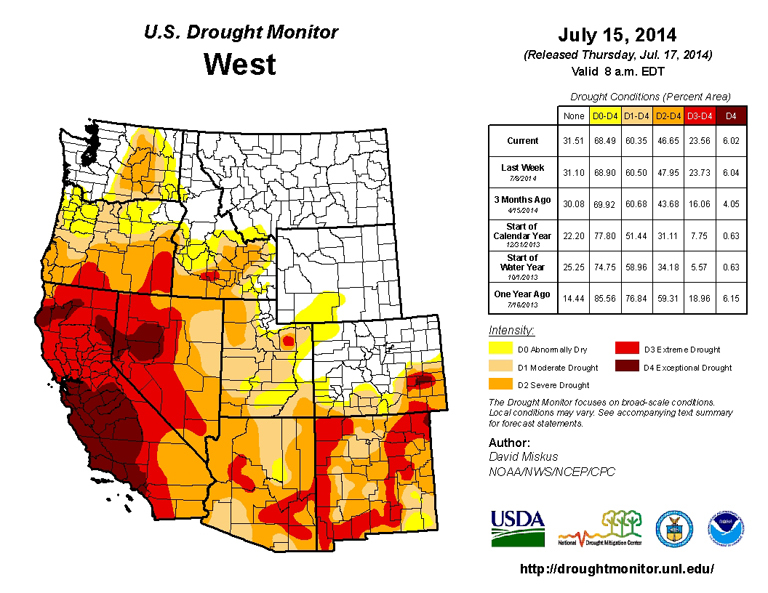 Drought conditions across the American West. Credit: US Drought Monitor. The summer phase of the North American Monsoon is in full swing. But what, you may wonder, is a monsoon? While most people associate a monsoon with rain, that is only half the story. It is actually a wind system. More specifically, according to NOAA, a monsoon is “a thermally driven wind arising from differential heating between a land mass and the adjacent ocean that reverses its direction seasonally.” In fact, the word monsoon is derived from the Arabic “mausim”, meaning seasons or wind shift. In general, a monsoon is like a large-scale sea breeze. During the summer months, the sun heats both the land and sea, but the surface temperature of the land rises more quickly. As a result, an area of low pressure develops over the land and an area of relatively higher pressure sits over the ocean. This causes moisture-laden sea air to flow inland. As it rises and cools, it releases precipitation. In winter, the dry season, this situation reverses. Monsoon wind systems exist in many different parts of the world. 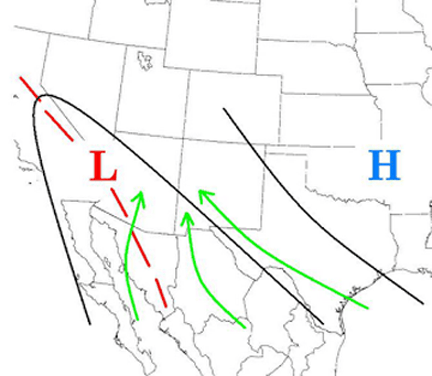 In the U.S., we have the North American Monsoon that impacts states across the southwest. Summer temperatures in this region – mostly desert – can be extremely hot. Readings in the triple digits are not uncommon. This intense heat generates a thermal low near the surface and draws in moist air from the nearby Gulf of California. In addition, an area of high pressure aloft, known as the subtropical ridge, typically moves north over the south-central U.S. in summer. Its clockwise circulation shifts the winds from a southwesterly to a southeasterly direction and ushers in moisture from the Gulf of Mexico. This combination of heat and moisture rich air produces thunderstorms and heavy rainfall across the region between July and September. In fact, summer monsoon rains are reported to supply nearly 50% of the area’s annual precipitation. The summer monsoon officially begins, according to the National Weather Service, when there have been three consecutive days with a dew point above 54°F. 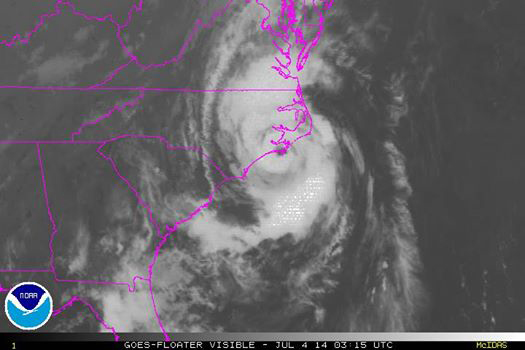 Hurricane Arthur made landfall in North Carolina’s Outer Banks late Thursday night. It was the first named storm of the 2014 Atlantic Hurricane Season and the earliest to strike N.C. in the state’s history. Coming ashore with 100-mph winds, Arthur was classified as a category-2 hurricane. These powerful winds coupled with storm surge flooding caused widespread power outages and property damage throughout the area. Luckily, no serious injuries or fatalities have been reported. Traveling north, parallel to the coastline, Arthur soon moved over cooler waters and was downgraded to a tropical storm. Nonetheless, it still brought high winds, heavy rain, and rough surf to many Atlantic beaches over the July 4th holiday weekend. Arthur was the first hurricane to make landfall in the continental U.S. since 2012. On July 4, 1776, Jefferson was in Philadelphia, PA for the signing of the Declaration of Independence and noted that the high temperature for that now famous day was 76°F. The Earth will reach its aphelion today at 8 P.M. Eastern Daylight Time. This is the point in the planet’s elliptical orbit where it is farthest from the Sun. While the planet’s distance from the Sun does not cause the seasons, it does influence their length. As a function of gravity, the closer the planet is to the Sun, the faster it moves. So, at the aphelion, the Earth will move more slowly along its orbital path than at any other time of the year. As a result, summer is elongated by a few days in the northern hemisphere. Summer officially began last month, but the season’s heat is just now getting into full swing in New York City. In Central Park today, the temperature soared to 91°F. That marks the city’s first 90° day of the year. 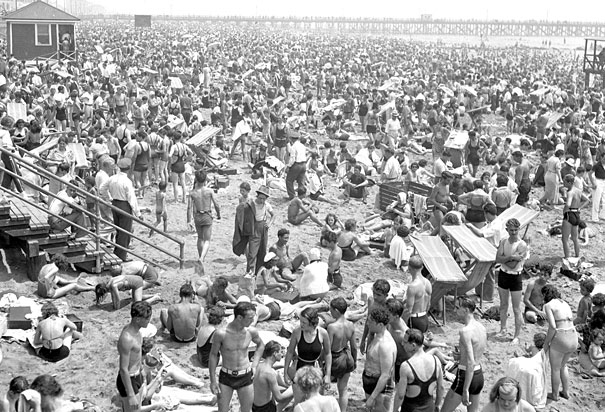 While readings in the 90s are not unusual for the Big Apple in July, they typically premiere earlier in the season. In fact, with records dating back to 1869 for Central Park, the NWS reports that only nineteen years have failed to produce a 90°F day before the end of June. On average, according to the NWS, the city generally sees its first 90°F day by June 3rd. Its earliest was April 7, 2010 and its latest was July 26,1877. Last year, NYC’s first 90°F reading was on May 30th.